The Endless Online Report: Endless Online Classic has been Relaunched! 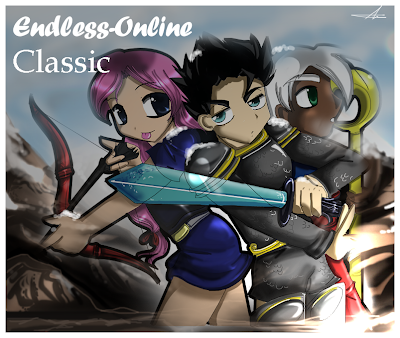 Endless Online Classic has been Relaunched! Endless Online Classic has been relaunched under the name EO2! Hope to see you in-game soon! Very sorry about that, the server was having some problems. It is now online. Fun server needs more players though. Has potential. Hey, Been playing a few days now... but spells don't work. I tried to learn heal self and even though i have all of the requirements, the spell can't be learned. :( It gets to the confirm purchase thing but when i select ok, nothing happens. Hello Dylan - I'll fix that as soon as possible. Apparently the issue is only with Self Heal. Sorry to be a nuisance Brink, but I've just discovered another bug. Tried buying a Lotus Sword from Ice Shop and it behaves the same way as heal self behaved (click 'ok' to confirm purchase, the ok screen disappears but the purchase doesn't happen). The server is currently hosted in USA by Paperclip. He isn't responding right now, but it shouldn't take long. The server's power supply blew out.. I sent it in to be fixed, no data loss. It'll be back by thursday. Sorry dude! Hey Brink is there any other links for the download? This one is broken. Is this still active? I remember playing this years ago, and I've never been able to get back into due to lack of updates and how "horrible" it is now. No other game has ever been made like this, to my knowledge.